Enteroviruses are common viruses that are spread among people by secretions from the gastrointestinal tract or sometimes by respiratory secretions. They are small RNA viruses that belong to the family Picornaviridae and are typically classified as polioviruses or non-polio enteroviruses. Poliovirus is the prototypical enterovirus that can cause a broad spectrum of disease ranging from mild infections to meningitis or paralytic poliomyelitis; these viruses are described in detail in other articles. Non-polio enteroviruses are the remaining viruses in this group and cause up to 15 million infections per year in the U.S. A number of different viral types belong to the non-polio enteroviruses, including Coxsackieviruses, echoviruses, enterovirus D68, and other enteroviruses. Most cases of non-polio enterovirus infection do not produce any symptoms or produce only a mild illness such as a common cold. Non-polio enteroviruses can infect anyone, but most of those who become ill from these infections are children and teenagers, because they have had less time to develop immunity. Infections with non-polio enteroviruses in the U.S. are most common in the summer and fall months. As mentioned previously, most infections with non-polio enteroviruses do not cause symptoms. When symptoms do occur, the clinical presentation depends upon the type of virus as well as factors such as host immunity. Those with weakened immune systems, such as from cancer chemotherapy, are at particular risk for serious infections. Infants are also at risk for serious infections. Some of the types of infections caused by non-polio enteroviruses are respiratory infections (the common cold), which can be caused by numerous enteroviruses. Meningitis, conjunctivitis, hand, foot, and mouth disease, paralysis, myocarditis, pericarditis, and spastic paralysis are also caused by non-polio enteroviruses. Non-polio enterovirus infections are transmitted from person to person. The viruses can be found in the bodily fluids (sputum, nasal secretions, saliva, fluid from skin blisters, or feces) of an infected person. Therefore, close contact with an infected person is the biggest risk factor for non-polio enterovirus infection. Other behaviors that increase the risk of infection include touching surfaces or objects contaminated by bodily fluids from an infected person, changing diapers of an infected person, or drinking water that has been contaminated by virus. Symptoms and signs of non-polio enterovirus infection depend on the virus type and host immune response. Most infections either do not cause symptoms or cause mild illnesses with symptoms such as runny nose, cough, sneezing, fever, rash, mouth blisters (herpangina), and body aches. Hand, foot, and mouth disease is a condition characterized by fever, blisters in the mouth, and a skin rash. It occurs most commonly in children younger than 5 years of age, but it can sometimes occur in adults or older children. Other non-polio enterovirus infections may cause meningitis, accompanied by symptoms such as painful headache, sensitivity to light, fever, stiff neck, irritability, and nausea and vomiting. Meningitis caused by enteroviruses is most common in infants and children. Hemorrhagic conjunctivitis, the inflammation of lining membranes of the eyes accompanied by bleeding, is another possible manifestation of non-polio enterovirus infection. Serious infections with non-polio enteroviruses are less common but may cause pericarditis (inflammation of the outer lining sac of the heart), myocarditis (inflammation of the heart muscle), encephalitis (inflammation of the brain), and paralysis. Enterovirus D68 (EV-D68) was first identified in 2008, with the most recent outbreak described in the U.S. in 2014, causing respiratory illnesses. Symptoms of EV-D68 infection can include breathing problems, cough, and a rash; some patients develop wheezing. Young children and those with respiratory conditions such as asthma typically have more severe symptoms. Most enterovirus infections are diagnosed by their clinical signs and symptoms. Illnesses such as hand, foot, and mouth disease are recognized by the symptoms and physical findings, and specific testing to determine which virus is responsible for the symptoms is typically not carried out. As with illnesses such as the common cold, blood tests to precisely identify the viruses are not frequently done. The most reliable test for diagnosing enterovirus infections is polymerase chain reaction (PCR) that identifies the genetic material of the virus. The PCR test is available from specialized laboratories and is used most often during outbreaks of viral infections such as the EV-D68 outbreak in the U.S. in 2014. Less frequently, enteroviruses can be identified by cultures and immunological tests performed on blood, feces, or cerebrospinal fluid. 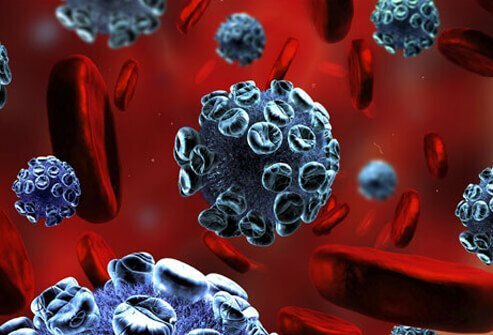 Sometimes, laboratory tests may be done to distinguish between enterovirus infections and other viral infections like rotavirus infection and influenza virus infection. Other diagnostic tests such as imaging studies, echocardiography, or lumbar puncture may be ordered to help determine the extent of infection. Antibiotics are not effective against viral infections, and there are no antiviral medications approved for the treatment of non-polio enterovirus infections. Treatment is supportive, meaning that treatments are directed toward relieving the symptoms of the condition rather than eradicating the infection. In newborns and people with suppressed immune systems who have severe infections, immunoglobulins against the viruses have been used with varying degrees of success. Supportive treatments include measures to improve breathing capacity, ranging from oxygen therapy to inhaled steroids to ventilator support. Other medications that may be prescribed include pain-control medications and medications to reduce fever. Home remedies may be appropriate for mild infections such as respiratory infections. These can include over-the-counter pain and fever-control medications. Some complications of non-polio enterovirus infections have been discussed previously. Complications are most common in neonates and those with suppressed immune systems. Complications include infections that spread to the heart, brain, or bloodstream. Infections of the heart can lead to heart failure, and infections of the brain can lead to paralysis or other long-term effects. Non-polio enteroviruses have also been suggested as one of many factors that play a role in the development of type 1 diabetes in children, although the infection alone is not sufficient to cause diabetes. Non-polio enterovirus infection is very common, and it is likely that pregnant women may be exposed to someone with the illness. Like most adults, pregnant women who develop an infection with one of the non-polio enteroviruses will likely have no symptoms of the infection or have only mild symptoms. There is no definitive evidence that suggests that non-polio enterovirus infection in pregnancy leads to an increased risk of birth defects, miscarriage, or other complications of pregnancy. If an infection occurs shortly before delivery of the baby, there is a chance that the mother may pass the infection to her baby. In most of these cases, the baby only develops a mild illness, but rare cases can lead to severe infection. The vast majority of cases of non-polio enterovirus infection do not cause symptoms or cause mild illness with an excellent prognosis. Symptoms tend to go away on their own after seven to 10 days. Complications (as discussed above) are rare. When complications do occur, long-term consequences such as paralysis or heart failure, and rarely even coma or death, can result. Prevention of non-polio enterovirus infection is best accomplished by avoiding contact with infected people, using good sanitation practices, and by disinfecting potentially contaminated surfaces. There is no vaccine available to prevent infection with the non-polio enteroviruses. Schwartz, Robert A. "Enteroviruses." Medscape.com. Sept. 11, 2014. <http://emedicine.medscape.com/article/217146-overview>. United States. Centers for Disease Control and Prevention. "Non-Polio Enteroviruses." Sept. 24, 2014. <http://www.cdc.gov/non-polio-enterovirus/>. What were your enterovirus infection symptoms and signs? If your child was the one who was ill, please tell us your child's symptoms and signs. What was the treatment for your enterovirus infection? If your child was the one who was ill, please tell us your child's treatment.